The first half of the 17th century was a time of musical experiments. New forms of instrumental and vocal music were born, among them the sonata and opera. Composers started to write virtuosic music for instruments like the violin and the cornett, and experimented with different temperaments and harmony. In comparison, the second half of the century was a time of formalisation. Genres like the sonata and the cantata were standardised. The names of Arcangelo Corelli and Alessandro Scarlatti figure prominently among those associated with this development. The present disc is a musical illustration of this process of formalisation. The frontispiece suggests that it is devoted to just one composer, and an unknown quantity at that: Domenico Zanatta. However, the programme also includes pieces from a previous generation, from the pen of Francesco Cavalli, Barbara Strozzi and Giovanni Battista Fontana. The sonatas and vocal pieces from their pen are different from those, which Zanatta published between 1689 and 1696. There is very little about Domenico Zanatta (or Zanata) in New Grove. It says that he was born in Verona, but according to Rodolfo Zitellini, in his liner-notes, he was from Venice. In 1689 he published his first collection of music, twelve sonate da chiesa op. 1, which were printed in Bologna. Shortly afterwards he entered the corporazione dei sonatori in Venice as a violinist. Between 1695 and 1715 four further collections of vocal and instrumental music were published there. Among them are the Cantate a voce sola op. 2 and the Intrecci armonici op. 4, from which the two vocal items on this disc are taken. In the meantime he worked as maestro di cappella in Montegnana, a small town near Venice. He spent the second half of his life in Verona. His presence there is attested from 1709. In 1724 his son Girolamo was appointed maestro di cappella at the Cathedral, but he handed the post over to his father, probably to secure him a regular income. The programme includes three sonatas for two violins and basso continuo from the Op. 1. They comprise four movements: grave - allegro - grave - allegro. They bear witness to the formal design of the sonata, which came in vogue in the late 17th century, and which we also find in Corelli's oeuvre. These are juxtaposed to two sonatas from the first half of the century, written in the stylus phantasticus, which was born around 1600. Although the sonatas by Cavalli and Fontana are in different sections, there is no formal division into clearly separated movements. The number of sections could also greatly vary. The scoring was mostly left to the interpreters. The melody parts could be played on various instruments, such as the violin, the cornett or the recorder, and the lower parts on a string bass, the dulcian or the sackbut. Cavalli's Sonata à 3 is mostly played by strings (two violins and a string bass), but there is no objection against playing the upper part on the cornett, as is the case here. Cavalli has become best known for his operas; he was the main composer of music for the stage in Venice after the death of Monteverdi. A popular genre at the time was the lamento, which could either be a separate composition or be included in an opera, as is the case here: the Lamento di Apollo is from Cavalli's opera Gli amori d'Apollo e di Dafne from 1640 (recorded complete by Gabriel Garrido; K617, 2009). It has no standard form; in Cavalli's lamento we see some separation between recitativic passages and episodes of a more lyric character, which would develop into the aria. This same development can be observed in Presso un ruscello algente by Barbara Strozzi, who was one of the first composers to use the term cantata. However, this has little in common with the cantatas, which were written at the end of the century and beyond, the form of which was more or less standardised by Alessandro Scarlatti. The basic form laid down by him was a sequence of two recitative and (dacapo) aria pairs. However, he sometimes deviated from this form by adding an aria to open the cantata, or a sinfonia for one or two instruments. 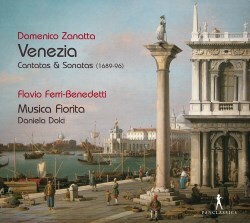 Zanatta's cantata Gelosia is taken from the Op. 4 and comprises three arias, separated by recitatives. The title says what it is about: jealousy. The three arias are all in dacapo form. In comparison Sorta è la notte opaca from the Op. 2 is very different. It is called serenata but it has nothing to do with the form of vocal composition known as serenata in the 18th century, a work for solo voices and orchestra, written in honour of one particular person. Here the word needs to be taken literally, referring to the night. That is indicated in the very first line: "Dark night has risen". The darkness is also a metaphor for the state of mind of the protagonist, who refers to his beloved as the "snake of my heart". There are no indications of recitative and aria, but formally it follows the pattern which was in the process of becoming the standard. It opens with a sinfonia in three movements: fast - slow – fast, followed by three pairs of recitative and aria. Only the second aria has a dacapo; it has the character of a rage aria and the trumpet mentioned in the text is depicted by fanfare figures. Flavio Ferri-Benedetti effectively depicts the dark and nightly character of this piece, especially in the opening sections. The outbursts of anger and despair are also very well explored. One of the features of his performances is the incisive expression of the text and the various affetti. It is particularly nice to hear a completely natural performance of the recitatives and recitativic episodes, which are so often too strict in time. Here they are taken in a natural speech rhythm. For the lowest notes he goes to his chest register. The performances of the pieces by Cavalli and Strozzi are just as good. As the instrumental works also receive excellent performances, this disc is a most eloquent case for Zanatta whose works seem to appear on disc for the first time. I hope that more of his oeuvre will be performed and recorded. It is just a shame that the booklet omits English translations of the vocal items.